Ozomatli Turns To A New Cool: Kids' Music The Grammy-winning band is known for mixing music styles and writing lyrics about immigration, violence and other issues. But now it's turning to kid-friendly fare: songs about trees, germs, even a moose on the loose. 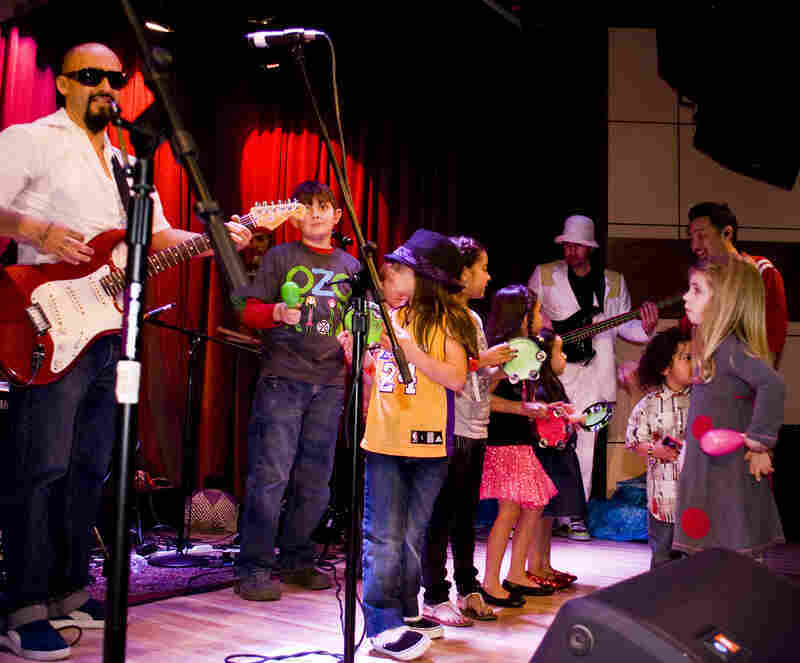 Band member Jiro Yamaguchi talks about the band's new album, Ozomatli Presents OzoKidz. Band members (from left) Justin Poree, Ulises Bella, Jiro Yamaguchi, Raul Pacheco, Asdru Sierra and Wil-Dog Abers. The Grammy-winning band Ozomatli is known for its effortless mashup of musical styles, including funk, hip-hop, rock and salsa. The band got together about 17 years ago in Los Angeles and has performed around the world, including as U.S. Cultural Ambassadors. Ozomatli's lyrics have taken on serious issues like immigration and gang violence, but now it's heading into new territory: kids' music. The band's latest album, Ozomatli Presents OzoKidz, includes fun and educational songs about trees, animals — even balloons and birthday parties. Band member Jiro Yamaguchi tells NPR host Michel Martin that Ozomatli always had a saying: "Ozomatli is for the kids." It has played for kids in after-school programs and at shows for all ages. It has even written music for PBS and the video game Happy Feet 2. "All these projects helped our 'kid chops,' I guess you would call it — you know, starting to get our frame set for making our own kids' album," Yamaguchi says. Most of the band members are fathers themselves. "We're in a different place than we were back then, you know, going to clubs and partying and living the road life," says Yamaguchi. "Now we are raising children. And I don't want to make it sound like we're not cool ... but I think responsibility is the new cool." Yamaguchi points out that when they're writing kids' music, they keep in mind the adults who are also listening. Often, they're listening to the same songs their little ones play on repeat. "If you're driving in your car and your child is demanding certain music, you know, you want the adult or the parent — whoever is in the car with them — to like it, too. Or else they're going to take it out eventually," he says. When the band performs for kids, it's a high-energy and interactive experience. Yamaguchi says the band members act like kids onstage — just having fun. They're also encouraging their fans to dance. "We are telling them, 'Raise your hands! Scuffle to the side! Move to the left!' " says Yamaguchi. "The kids get into it. We play for about 30 minutes, because beyond that, the attention starts to wander." The song "Moose on the Loose" is a fan favorite, says Yamaguchi. It tells the story of kids camping in the woods who suddenly see a moose running amok and must fend for their safety. Yamaguchi says Justin Poree, the one who sings and raps in the song, came up with the idea. "He actually just came in with it one day. He was like, 'Check out this song!' And we were like, 'Oh, my God! That's a really great song!' "
Another popular song is "Balloon Fest," which was inspired by the band's experience at the Bowery Ballroom in New York City. Yamaguchi says they were preparing for a show backstage, where there were tons of balloons. Their publicist and his young daughter were there, too. They all spontaneously began throwing the balloons around. Each time the balloons got thrown up — and each time they landed — someone yelled "Balloon fest!" Yamaguchi says his publicist's daughter was really hyped. So, years later, the balloon fest came to mind when they were brainstorming about song ideas. In terms of balancing work and family, Yamaguchi says the band has been doing less touring and more writing. The members are also able to stay home more. Yamaguchi says his wife is very supportive and helps raise their 4-year-old daughter. "It's really a balance and a lot of communication," he says. He hasn't traded his car in for a minivan yet, but he enjoys being both a rocker and a family man.